Scott Wood has gone from a glorified “helper” to senior VP for Unified Technology Systems, one of the largest employee-owned operations in AV, plowing his own road to AV success. It doesn’t take long to see the passion Scott Wood brings to his job. And that’s especially impressive more than 20 years after he joined what was then a seven-person company — as a “glorified helper” — on a bit of a whim. Today, of Unified Technology Systems is among the largest in the pro AV space and he’s a senior VP. Wood, 51, became senior VP and regional manager for South Carolina and Tennessee for the recently rebranded Unified Technology Systems (formerly Unified AV Systems) about 18 months ago when the company regionalized its operations as it continued to grow. And, after more than 20 years with the company in its various incarnations, Wood has grown with the company too. He went from a customer of Video Systems while working in the telemedicine space in the late 1990s to joining the company as its eighth employee. That’s not to say Wood went right to the top, even at the fledgling operation. “There’s the bottom, then there’s where I started,” Wood says with a laugh. “There’s the bottom, then there’s where I started,” he says with a laugh. He moved his way up the ranks from “basically a helper” to a technician, then into project management and technician, to engineering, project manager and technician, before eventually leading the technical services division over those three departments before the merger with Multimedia to become Unified AV Systems in June 2011. Wood became chief technology officer for Unified, and was responsible for technical services and information systems before an increased focus on technical services until about 18 months ago when the company went to a regional platform and he took over the S.C./Tenn. region. “This has been the most challenging role, but it’s been a very exciting ride,” says Wood. Wood’s interest in electronics came from his time in the Navy, where he worked on F-18s. “Where else can an 18-year-old be responsible for a $30 million airplane,” he asks. After Navy, he worked for a large health care system in Charlotte, N.C., focusing on voice and data, before jumping into telemedicine. Wood will be at the Total Tech Summit for the first time next month in Pittsburgh, where he’ll be part of a panel discussion that will focus on successful ideas business leaders have enacted to help them grow. He’ll talk about Unified’s Chalk Talk approach to gathering teams together to hash out plans for a project before they bid on it. 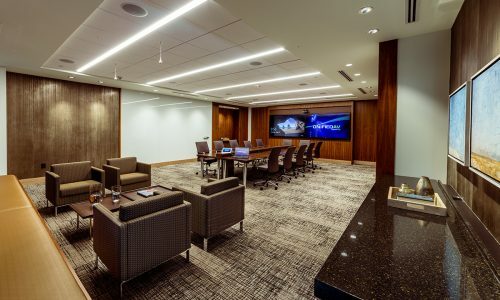 Commercial Integrator: Unified AV Systems recently rebranded as Unified Technology Systems. What was the thinking behind that and what do you expect it will achieve? Scott Wood: AV and IT have become one and we wanted to be in that world. By bringing in other technologies, we now have a full complement we can work in. It’s definitely sparked attention, but we’ve been working in this field for almost a year, now so it’s not brand new to us. We’re seeing a lot of turnkey solutions, seeing a lot of cross-training and more ability in our workforce to be more adaptive to our environment. CI: What’s your philosophy on recruiting and retaining young talent to Unified? SW: We’ve been involved in the AVIXA grant program for a few years and had three students come to us through that program. It’s a benefit to both parties involved. I’ve watched people come through the program and really grow and learn. They’re like sponges and we get to give them a new perspective. When the program’s over and our agenda is to go full-time, they’re ready to go. We talk a lot about creating that continuous influx of new employees. It’s really important that person we hire is a good fit, especially in an employee-owned company. A lot of people will choose Unified for the culture over $1 more an hour. When you’re part of an environment where people have been here for 25 years or more, that says a lot about this company and where it’s going. If you want to grow within the company, don’t focus so much on position you want to take. You need to think about who’s going to fill your shoes. We want to make sure there’s growth for everyone. CI: How has recruiting and employee retention changed? SW: We don’t necessarily lead with the word ‘AV’ anymore. Everyone now has more of an IT background and that’s what we seek out. Everything we install today rides on the network. When I’m talking to someone who was born after I started working, it’s interesting for me. This industry is growing so fast and industry is changing so fast. I know AV and IT aren’t a typical program at any college but if you pick the right company, the sky’s the limit. I’ll never call [recruiting] easy. The story behind the company sells that company. That sells more than money and that’s what excites me.